Have you ever stood in a financial aid line twenty students long? 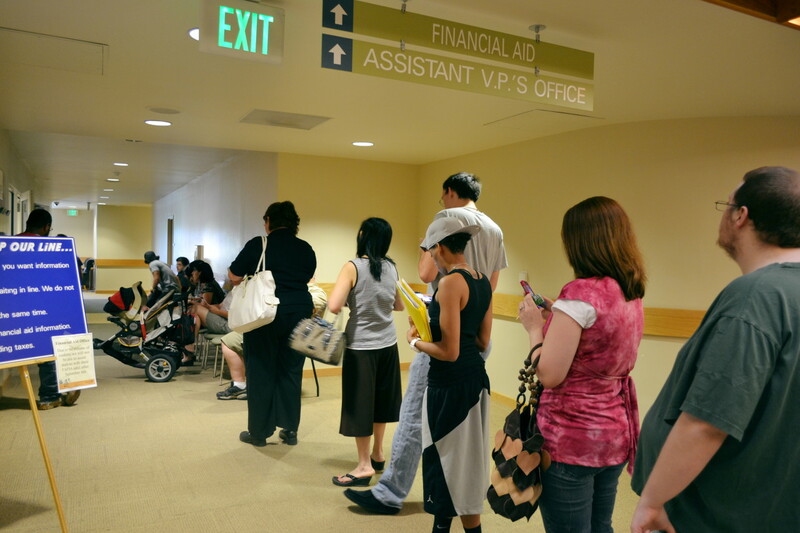 To alleviate this common problem, the Financial Aid Department at Salt Lake Community College has a few different methods in place in hopes that the lines can move quicker. The first method is the recently created Consent to Release Information form. After filling it out, students can call into the department for information instead of visiting it in person. As stated on the form, it “requires you provide a password that will allow you and those you share your password with to access information over the telephone.” Whoever calls to get your information has to know your password and student identification number. No one else can access it. Even if the wait is long on the phone, at least you can watch a television show or do homework while you wait, both of which are difficult or impossible to do while standing in a line. While a phone call may be a great option for some, not all may enjoy the idea of releasing their information over the telephone. Luckily, the Taylorsville Redwood, South City, Jordan and Miller campuses all have financial aid offices. The Taylorsville Redwood Campus can get very busy during the afternoon, but Cristi Millard, the Director of Financial Aid at SLCC, explained that, “most people don’t realize that the financial aid office at Redwood is open until eight” in the evening. The South City Campus gets busy as well. Not as busy as Taylorsville Redwood, but it also has a smaller office. A frequent visitor of the Jordan Campus explained that the line moves pretty quickly there and most people do not arrive until around 10:00 a.m. Miller Campus does not go through much more than forty students on a busy day, but that is the work of just one advisor. The best way to beat the rush seems to be arriving early or late. Each campus opens up around 8:00 a.m. and they close at various times. South City and Taylorsville Redwood do stay open the latest. Saving time is a necessity for many college students, so knowing about these options may help you in your quest for financial aid. But there are other things to keep in mind when filing for aid. Millard recommends filling out all of the necessary paperwork before meeting with an advisor and double checking the documents to make sure you fill in everything. She commented that a lot of students skip over some parts, thinking that they do not apply to them. This oversight can make the process of receiving financial aid take as much as three weeks longer. To help with this process, the Financial Aid Department has a glossary and FAQ sheet on its website. The glossary lists terms associated with financial aid and the FAQ sheet helps with commonly asked questions. These tools can help to decrease the need for a trip or call to the financial aid offices. When applying for financial aid, it is important to look at all the options and be prepared when speaking to an advisor. That way, you can get out of there faster and help the line move more quickly for your fellow students. For office hours and other information, visit http://www.slcc.edu/financialaid. Are student loans financial aid?